4. To help Suppress eye inflammation (uveitis) and liver failure. Chokeberry (Aronia melanocarpa) is one of the shrubs that invades mesic sand prairies, sometimes forming its own 'shrub prairie, which is also called black chokeberry. 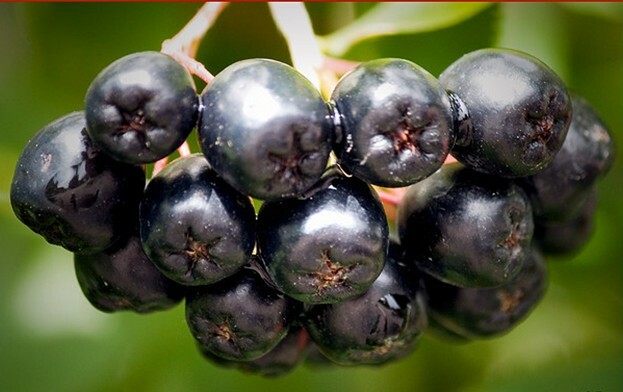 Black Chokeberry has attracted scientific interest due to its deep purple, almost black pigmentation that arises from dense contents of phenolic phytochemicals, especially anthocyanins. Total anthocyanin content in chokeberries is 1480 mg per 100 g of fresh berries, and proanthocyanidin concentration is 664 mg per 100 g. Both values are among the highest measured in plants to date. Analysis of anthocyanins in chokeberries has identified the following individual chemicals (among hundreds known to exist in the plant kingdom): cyanidin-3-galactoside, epicatechin, caffeic acid, quercetin, delphinidin, petunidin, pelargonidin, peonidin and malvidin. All these are members of the flavonoid category of antioxidant phenolics.